In 1834, Joseph Smith and members of the Zion's Camp march stumbled onto some bones in southern Illinois. According to the journals of several other church leaders who were present at the time, Smith received a revelation about the buried remains telling him that they were from a mighty Lamanite warrior named Zelph who was described as a "white Lamanite" allied with the Nephites. The traditional belief has been that the events described in the Book of Mormon took place across the entirety of North and South America. The story of Zelph buttresses this belief. However, in recent years, some Mormon scholars do not believe in the traditional Book of Mormon geography. Because they favor a belief that the Book of Mormon took place in Central America, they have insisted that Joseph Smith never spoke of Zelph. Other Mormon scholars accept the Zelph account but do not think it bears any significance on the geography of the Book of Mormon. According to critics of the church, the Zelph account presents significant problems for either the traditional belief that Book of Mormon people populated the entire North and South American continents or the new Central American one. Like the Greek Psalter incident, they also believe it shows a tendency of Joseph Smith to make up revelation on the fly to suit his purposes. Chapter Twelve: Zion's Camp, Church History In The Fulness Of Times Student Manual, (2003). Link is here. One mile south of Valley City on the bluffs of the Illinois River is the storied “Zelph Mound,” now on private property so tourism is not encouraged. Here, on June 3, Joseph and a few others climbed the bluffs and dug into a mound, unearthing a skeleton. 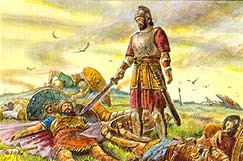 Joseph is reported to have identified the remains as those of Zelph, a righteous Lamanite warrior killed in battle (see History of the Church, 2:79, 80n). About half a mile north of Zelph Mound, back towards Valley City, is a very rough road cutting west up through the bluffs. This is Church Hollow Road, apparently the only original portion of trail left on the entire Zion's Camp route. After two and one-half miles the road improves, coming out on the prairie and leading to Pittsfield. "Zion's Camp March from Ohio to Missouri, 1834" by Stanley B. Kimball, em>Ensign April 1979. In 1834, Joseph Smith said he received a revelation from God, calling for a militia to be raised in Kirtland which would then march to Missouri and "redeem Zion." About 200 men and a number of women and children volunteered to join this militia, which became known as "Zion's Camp." On June 3, 1834, in Pike County, Illinois, some of the men of Zion's Camp located some bones and an arrowhead about a foot below the ground. Smith himself wrote nothing about the event, however, seven of the members of Zion's Camp who were with him either recorded or orally related their accounts of what was said. These accounts declared that the bones were from Zelph, a "white Lamanite" general who was a righteous man. Heber C. Kimball wrote in 1841 that several of the group, along with Joseph Smith, walked to the top of a mound that they had located on the bank of the Illinois river. Kimball states that "[o]n the top of this mound there was the appearance of three altars, which had been built of stone, one above another, according to the ancient order; and the ground was strewn over with human bones." This prompted Kimball and the others to dig into the mound after sending for a shovel and a hoe. "At about one foot deep we discovered the skeleton of a man, almost entire; and between two of his ribs we found an Indian arrow, which had evidently been the cause of his death. We took the leg and thigh bones and carried them along with us to Clay county. All four appeared sound." After continuing on their journey, Kimball reports that "[i]t was made known to Joseph that he had been an officer who fell in battle, in the last destruction among the Lamanites, and his name was Zelph. This caused us to rejoice much, to think that God was so mindful of us as to show these things to his servant. Brother Joseph had enquired of the Lord and it was made known in a vision." Reuben McBride's journal account states that "His name was Zelph a war[r]ior under the Prophet Omandagus Zelph a white Laman[i]te." McBride also wrote that "an arrow was found in his Ribs…which he said he sup[p]osed oc[c]aisoned his death." McBride wrote that Zelph "was known from the atlantic to the Rocky Mountains." Moses Martin stated "Soon after this Joseph had a vision and the Lord shewed him that this man was once a mighty Prophet and many other things concerning his dead which had fal[l]en no doubt in some great bat[t]les." Levi Hancock's journal also refers to "Onendagus," stating that "Zelf he was a white Lamanite who fought with the people of Onendagus for freedom." Onandaga is the name of a county in New York state [approximately 10 miles from Palmyra] as well as the name of a tribe of the Iroquois Confederacy that once occupied the area. "Zelph," Wikipedia article (accessed 16 February 2016). Smith's statements in later years suggests that his thinking regarding the location of Book of Mormon events evolved over time. Smith stated that he believed that the discovery of ancient Maya ruins on the Yucatán Peninsula in the late 1830s offered evidence to the Book of Mormon's authenticity. After reading about the accounts, Smith proclaimed the ruins were likely Nephite. Zelph is not an individual mentioned in the Book of Mormon narrative and would therefore not necessarily be associated with any of the events presumed to have occurred in Mesoamerica. There is nothing in the Book of Mormon narrative that excludes the possibility of people moving northward into the North American continent either during the period of the events described, or during the period of time between the conclusion of the record and the recovery of the golden plates. The implication of belief in a hemispheric Book of Mormon geography by these men is supported by several references made by Wilford Woodruff. Woodruff writes that he "visited many of the mounds which were flung up by the ancient inhabitants of this continent probably by the Nephites & Lamanites." Woodruff also states that Zelph "that was known from the hill Cumorah on East sea to the Rocky mountains," thus implying that the hill Cumorah in New York is the same hill Cumorah referred to in the Book of Mormon. Some LDS scholars believe that "hill Cumorah" was Woodruff's term rather than Joseph Smith's, since other accounts refer only to the sea and fail to mention either Nephites or the hill Cumorah. In 1842 Willard Richards compiled a number of records in order to produce a history of the church. Among the records examined were the various accounts related to Zelph. In the process of combining the accounts, Richards crossed out Woodruff's references to "hill Cumorah," and Heber C. Kimball's reference to the "last" great struggle with the Lamanites." "Zelph," Wikipedia article (accessed 15 June 2009). Did the Book of Mormon take place outside of Mesoamerica? The History of the Church records the Zelph incident as factual and the accounts by seven prominent church members all support the event as recorded in the HOC. However, some LDS apologists downplay Zelph into the realm of not real as the account isn't in Joseph Smith's handwriting and the existence of Zelph in Illinois hurts their arguments against the BOM taking place in a Limited Geographical area somewhere in Central or South America. Most LDS apologists currently seem to support the BOM geography existing in Central or South America. The few 'radical' LDS apologists such as Rod Meldrum that still support the early church views of the BOM taking place exclusively in North America, are actually attacked by their fellow LDS apologists for actively promoting the idea that the BOM took place in North America. Probably most Latter-day Saints would not recognize the name Zelph. However, serious students of LDS Church history and Book of Mormon geography would likely know Zelph as the white Lamanite whose remains were found by Zion's Camp as they traveled through central Illinois. Our enemies had threatened that we should not cross the Illinois river, but on Monday the 2nd we were ferried over without any difficulty. The ferryman counted, and declared there were five hundred of us, yet our true number was only about one hundred and fifty. Our company had been increased since our departure from Kirtland by volunteers from different branches of the Church through which we had passed. We encampedon the bank of the river until Tuesday the 3rd. The primary source material for the Zelph story comes from diaries kept by some members of Zion's Camp.2 Six men wrote diary accounts concerning Zelph: Wilford Woodruff, Heber C. Kimball, George A. Smith, Levi Hancock, Moses Martin, and Reuben McBride. What do these six contemporary accounts tell us about Zelph? The answer to that question is based upon a careful analysis of the primary sources. Each diary account is reproduced herein as it appeared in the original, without changes in spelling or grammar. Following the printed text of each diary account is a paragraph summarizing the account and including my own interpretations. We visited one of those Mounds: considerd to be 300 feet above the level of the Illinois river. Three persons dug into the mound & found a body. Elder Milton Holmes took the arrow out of the back bones that killed Zelph & brought it with some of the bones in to the camp. I visited the same mound with Jesse J. Smith. Who the other persons were that dug in to the mound & found the body I am undecided. Wilford Woodruff tells us that these mounds were probably built by the Nephites and Lamanites. He also records that Joseph had a vision concerning the skeleton, learning that he was a white Lamanite, who had been killed in battle. His name was Zelph, "a large thick-set man and a man of God, he was a warrior under the great prophet that was known from the Hill Cumorah to the Rocky Mountains." On Tuesday the 3rd, we went up, several of us, with Joseph Smith jr. to the top of a mound on the bank of the Illinois river, which was several hundred feet above the river, and from the summit of which we had a pleasant view of the surrounding country: we could overlook the tops of the trees, on to the meadow or prairie on each side the river as far as our eyes could extend, which was one of the most pleasant scenes I ever beheld. On the top of this mound there was the appearance of three altars, which had been built of stone, one above another, according to the ancient order; and the ground was strewn over with human bones. This caused in us very peculiar feelings, to see the bones of our fellow creatures scattered in this manner, who had been slain in ages past. We felt prompted to dig down into the mound, and sending for a shovel and hoe, we proceeded to move away the earth. At about one foot deep we discovered the skeleton of a man, almost entire; and between two of his ribs we found an Indian arrow, which had evidently been the cause of his death. We took the leg and thigh bones and carried them along with us to Clay county. All four appeared sound. Elder B. Young has yet the arrow in his possession. It is a common thing to find bones thus drenching upon the earth in this country. From Heber C. Kimball's account we learn that several men went with Joseph Smith to visit the mound, which was several hundred feet above the Illinois River. He tells of altars being located on top of the mound. They discovered a human skeleton about one foot below the surface. There was an Indian arrow between his ribs. He said that Brigham Young had the arrow in his possession. The record from George A. Smith is much shorter than the other accounts. He gives the full date (Monday, June 2, 1834), tells of the height of the mound, and indicates Joseph Smith visited the mound the following morning. Another Church leader, Levi Hancock, served as one of the presidents of the Seventy. His account is the most detailed and complete of any of the six accounts. His diary is regarded as a reliable and accurate source for events he experienced. From Levi Hancock we learn some things previously known as well as some new information. Hancock identifies the Illinois River and says they were camped on the west side of the river. Further, he says the mound was a mile below the crossing, i.e., south [p.101] of the ferry. Following a vision, Joseph told the members of the camp, especially Sylvester Smith, about the bones. He told them this was the Land of Desolation and that Onandagus was their king. Zelph was a white Lamanite who fought for freedom. This mighty warrior was killed by an arrow. From Moses Martin the following is reported. They were in Pike County, and there were several large mounds. He furnishes details such as the excavation being two feet deep, the skeleton being extra large. He estimated the skeleton to be eight or nine feet tall because of the size of the thigh bone. There was a stone arrow in his rib cage. Joseph had a vision concerning the event and learned that this was a mighty prophet. These mounds were graves for the dead who had fallen in great battles. Reuben McBride's account is important because it was written close to the time of the event. It is, however, somewhat confusing because the information on Zelph is written in two different parts of his journal. In order to clarify the meaning, the entries relating to Zelph have been compressed together and the intervening, extraneous information has been deleted. From Reuben McBride we learn that the date was Tuesday, the third, when they visited the mounds. They dug up a skeleton and Joseph identified the remains as Zelph, a warrior under the prophet Onandagus. What do these six contemporary accounts tell us about Zelph and Book of Mormon geography? In order to answer this question, I will present the following summary containing the basic facts followed by the sources of information in parentheses. A key to abbreviations is also included. From the foregoing summary it seems evident that these accounts indicate the possibility of some Book of Mormon events being located in North America. The evidence in these journal accounts should be taken seriously for two reasons. First, there is a remarkable harmony and good agreement between the accounts. They are certainly not contradictory. Second, these are credible, competent witnesses. When one refers to the journal of Wilford Woodruff, for example, one is working with material which has been described by the experts as among the best nineteenth century journals. Indeed, [p.104] Woodruff's journals constitute basic source material for the published history of the Church. Heber C. Kimball and George A. Smith are also well-known for the accuracy and integrity of their journals. These records have also been included in the History of the Church. While not as well known as the three mentioned above, the other three writers are also reliable witnesses of historical events. This letter to his beloved Emma not only tells about the general news of the progress of Zion's Camp, it specifically deals with Book of Mormon matters. Joseph Smith was obviously very excited about the findings. He refers to the geographic area in Illinois as "the plains of the Nephites." He reports that the mounds belonged to the people of the Book of Mormon, and, further, that these discoveries were proof of the authenticity of the Book of Mormon. This letter shows that Joseph Smith firmly believed that some Nephites had inhabited North America before their final destruction at the hands of the Lamanites. Neither Joseph Smith nor the six journal writers associated with the Zelph incident were alone in writing and speaking about Book of Mormon geography. Nineteenth century Church members commonly referred to Book of Mormon locations in North America. Many of these people sincerely believed that at least some of the events described in the Book of Mormon took place in North America. The Times and Seasons, published by the Church in Nauvoo, often carried stories and statements about Book of Mormon geography. An example is this statement from Oliver Cowdery (original spelling has been preserved). These four quotations are a powerful statement concerning a North American location for events in Book of Mormon history. This belief of a North American location for certain Book of Mormon events was a certainty for these people. There is still another body of evidence that is entirely independent of the Church. I refer to the evidence from archaeological and anthropological studies of the area near Zelph Mound. Many studies of the area have been conducted during the twentieth century. Zelph Mound is referred to in scientific terms in [p.107] most of these reports as Naples-Russell Mound Number 8. Highway construction has prompted several recent archaeological investigations of the area. In order for the new state highway, Route 36, to span the Illinois River Valley, large cement and steel supports had to be constructed. The base of these supports on the west side of the river are located on the bluffs near Naples-Russell Mound Number 8. Before any major excavation began, teams of archaeologists came on site to conduct exploratory excavation and identify any artifacts recovered from the mounds. The results of these studies conducted by the state of Illinois, the University of Chicago, and other organizations are very revealing and interesting for Latter-day Saints. Although they use terminology such as Woodland and Hopewell Culture, which is not derived from Book of Mormon terms, the dates are clearly within the scope of Book of Mormon history. Some of the fabric recovered from the archaeological digs conducted on the bluffs dates between 100 BC and AD 400.15 I find this data to be absolutely astonishing. The various cultures and peoples which occupied the lower Illinois River Valley span several hundred years. Remarkably, items discovered in the Zelph Mound area fit precisely within the parameters of the Book of Mormon historical chronology. It seems to me that this general collection of evidence points to a possible North American Book of Mormon geographic location. At least it should be seriously considered and not ignored. Stating that there is a North American location for some Book of Mormon events does not exclude the possibility of other Book of Mormon events having occurred elsewhere. It seems possible to have Book of Mormon history occurring in both Central America and North America. This raises the feasibility of a connection between Central America and North America. Some studies link the people and culture of Central America with those in North America.16 These studies have been conducted by people who are not LDS and, consequently, do not share the same beliefs about the Book of Mormon and its origins. Nevertheless, they have made a connection between Meso-America and the Mississippi Valley, a connection which is potentially useful for Latter-day Saints. Where does all this lead us? What can we conclude about Zelph? What does the Zelph incident tell us about LDS Church history, Book of Mormon geography, and Joseph Smith? We know for certain that some members of Zion's Camp were on the west bank of the Illinois River in Pike County on 2 and 3 of June 1834. While in the area these men climbed up on a 300-foot earthen burial mound, overlooking the Illinois River. While on the mound on 2 June they uncovered a large skeleton. On 3 June Joseph Smith accompanied some of the men to the same burial mound. Later in the day he received a vision in which he learned that these skeletal remains belonged to Zelph, a white Lamanite, who had been a warrior under a leader named Onandagus. On 4 June on the banks of the Mississippi River, Joseph Smith wrote a letter to his wife Emma. In that letter he told her they had been wandering among the land of the Nephites. According to Joseph Smith this experience attested to the authenticity of the Book of Mormon. It seems to me that either approach carries heavy risks. When one chooses to state that Joseph Smith can't be taken seriously on [p.109] this issue, the door is opened to question his statements on other issues. Where does it stop? Does the First Vision, with the discrepancies in the primary source accounts, also come under the doubt and skepticism applied here to Zelph? Why can't we simply take Joseph Smith at his word? As I have shown, there is additional evidence which can be employed to support these claims. Statements made by nineteenth century Mormons about a North American location for the Book of Mormon can be used to support this position. Also, there is a considerable body of archaeological evidence concerning the people who lived in the Illinois Valley in ancient times. A North American location for some Book of Mormon events does not rule out a Central American location for others. The two are not mutually exclusive. The Book of Mormon is a book of scriptures, a religious record-not a geography book. Why not link Meso-America and North America? There are, after all, studies which already connect these two areas of the world. It seems to me that the foregoing conclusions dictate several challenges and tasks. It is important for Latter-day Saint scholars to further investigate the connections between Central America and North America. More work also needs to be done on nineteenth century LDS statements concerning Book of Mormon geography. There are interesting possibilities and much yet to be learned. I suggest we not reject the story of Zelph and its relationship to Book of Mormon geography until all these areas have been fully investigated. As things stand now we are still uncertain about any of the theories concerning Book of Mormon geography. 1. History of the Church, ed. B. H. Roberts, 7 vols. (Salt Lake City: Deseret Book, 1932-51), 2:79-80; hereafter HC. 2. Kenneth W. Godfrey, “The Zelph Story,” BYU Studies (Spr 1989): 31-56. This useful article contains a complete text of each of the six men who wrote diaries during the Zion's Camp experience. The arrangement of the texts, however, differs from those used in this article. 3. Wilford Woodruff's Journal, ed. Scott G. Kenney, 9 vols. (Midvale, UT: Signature Books, 1988), 1:10. Original Journal in the LDS Church Archives. I have deleted the note on the interlinear entry. 4. Times and Seasons 6 (1 Feb 1845): 788. 5. George A. Smith Journal (2 June 1834), LDS Church Archives. 6. Levi Hancock Diary, LDS Church Archives. 7. Moses Martin Diary, LDS Church Archives. 8. Reuben McBride Diary (3 June 1834), LDS Church Archives. 9. Dean C. Jessee, The Personal Writings of Joseph Smith (Salt Lake City: Deseret Book Company, 1984), 324. 10. Times and Seasons 2 (15 Apr 1841): 378. 11. Zera Pulsipher Autobiography, BYU Library. 12. Journal of Discourses 12:338; hereafter JD. 15. A general report is found in Douglas K. Charles, Steven R. Leigh, and Jane E. Buikstra, eds., The Archaic and Woodland Cemeteries at the Elizabeth Site in the Lower Illinois Valley (Kampsville: Illinois Department of Transportation by the Center for American Archeology, Kampsville Archeological Center, 1988). A brief account is in the Quincy Whig Herald (7 Nov 1975). 16. Clarence H. Webb, “The Extent and Content of Poverty Point Culture,” American Antiquity, No. 3, 33 (July 1968): 297-321; Robert Wauchope, General Editor, Handbook of Middle American Indians, Gordon F. Ekholm and Gordon R. Willey, eds., Archaeological Frontiers and External Connections (Austin, TX: The University of Texas at Austin Press, 1986), 4:110-131; Charles R. Wicke, “Pyramids and Temple Mounds: Mesoamerican Ceremonial Architecture in Eastern North America,” American Antiquity, No. 4, 30 (April 1965): 409-21; Robert Silverberg, Mound Builders of Ancient America (Athens, Ohio: Ohio University Press, 1986), 2-3, 6-7, 20-21, 24-25, 88-97, 202-11, 214-23, 226-27, 236-39, 242-49, 252-55, 260-69, 278-79, 282-85, 288-89, 292-95, 339-51. 17. Silverberg, Mound Builders, 285. 18. Dean R. Snow, The Archaeology of North America in Indians of North America, Frank W. Porter III, General Editor (New York: Chelsea House Publishers, 1989), 83. 19. See, for example, the comments in Klaus Hansen, Mormonism and the American Experience (Chicago, IL: University of Chicago Press, 1981), 36. Hansen says Joseph Smith was seeking relief from the burden of his office at the expense of his gullible followers. He was not serious about Zelph. 20. Godfrey, “Zelph Story,” 31-56. The differences between my arrangement of the sources and Godfrey's arrangement underscores the possibility of using the same sources to prove different points of view. He has sought to discredit the Zelph story while I have tried to support it. Book of Mormon scholars must remain tentative in drawing implications from this notable incident, though it does not diminish the fact that Joseph was moved by the spirit of revelation to speak about Zelph and his noble past in connection with Book of Mormon peoples or their descendants. We would learn that it is unclear which statements attributed to him derived from his vision, as opposed to being implied or surmised either by him or by others. Editor comment: How else could Joseph know such specific details like Zelph's name and that he was a "white" Lamanite if it wasn't for revelation? Also several of the witnesses specifically mention Joseph using revelation. Church leaders remained cautious and tentative with regard to identifying specific sites with particular events described in the Book of Mormon but were united in holding the view that the hill Cumorah near Joseph Smith's home was where Mormon and Moroni deposited the plates of gold that Joseph Smith later translated. President George Q. Cannon in 1887 wrote an editorial appearing in the Juvenile Instructor, which called for some caution relative to Book of Mormon geography and noted that there "is considerable anxiety manifested [among Latter-day Saints] to identify the sites of the ancient cities of the Nephites and to locate the exact spots where the stirring scenes described in the Book of Mormon were enacted." Cannon then declared that there are only "a few points which can be identified." The "hill known as Cumorah among the Nephites," he wrote, "and as Ramah among the Jaredites, is a spot which we are now familiar with, it being the place where Moroni concealed the records of his father, and to which the Prophet Joseph was directed by his angel guide." A quarter of a century later, however, Joseph Fielding Smith used the finding of Zelph to support his view that the hill Cumorah in the state of New York "is the exact hill spoken of in the Book of Mormon." The debate about Zelph's relationship to Book of Mormon geography will likely continue since the facts in hand do not allow for a decisive settlement of the matter. Thus historians should continue to gather and sift the evidence but also advise caution in drawing conclusions. If, as Sorenson and other writers suggest, most Book of Mormon history took place in Mesoamerica, what can we conclude regarding the discovery of the bones of a white Lamanite in Illinois and the golden plates in New York? It seems possible that some Lamanites could have wandered north after Moroni closed his narrative and fought battles on American soil, and the discovery of Zelph could be used by Latter-day Saints as prima facie evidence. We know, too, that the plates Joseph Smith translated came from a hill near his home and were deposited there by Moroni. Someday I hope Moroni explains more fully just where he was during those last three decades of his life, and I hope Zelph is by his side; and after Moroni is finished, I hope Zelph tells his story, geography and all. But until that day comes Latter-day Saints, including scholars, should remember the counsel President Joseph F. Smith gave in 1903 and not allow disagreements regarding the precise location of Book of Mormon cities and sites to divide them and cause feelings of ill will to fester. Joseph Smith, I believe, would have embraced those who take the Book of Mormon seriously, study it faithfully, and strive to learn all that it has to teach them, including the location of its various cities, battlefields, rivers, and streams. If information on the finding of Zelph is helpful, then we should be grateful that this little-known event in Mormon history happened. Still the message on the pages of the Book of Mormon that Jesus is the Christ and that its prophets were real people who spoke for God is far more important than the location of Zarahemla and Desolation. I agree with historian Don Cannon that "we not reject the story of Zelph and its relationship to Book of Mormon geography;" rather, we should be aware of how the story came to us as well as how it became a part of the history of the church. I hope that someday we will understand more fully just how Zelph, Onandagus, and others not mentioned in the Book of Mormon fit into the divine scheme of things on this, the American continent. Thus, it is unclear exactly what Joseph said. Many of the accounts date from many years after the event, and may have been shaded by later ideas in the writers. Joseph never had a chance to correct that which was published about the event, since he was killed before it was made public. The "Lamanites" may refer to native Amerindians generally, or Book of Mormon peoples specifically. If the latter are referred to, the events may well apply to post-Book of Mormon events, in which case it can tell us little about the geographic scope of the Book of Mormon text. As always, the Book of Mormon text itself must remain our primary guide for what it says. If we wish to test Joseph's claim that it was an ancient record, then others' opinions about its contents—even Joseph Smith's—are of limited value. If we accept the story of Zelph as factual as the evidence indicates, then obviously the Book of Mormon must have taken place in North America, or at least a significant portion must have taken place in North America. This is also reinforced by the numerous statements Joseph made in writing when he discussed the saints 'wandering over the plains of the Nephites' as the LDS men marched across Illinois during Zion's Camp in 1834. Some apologists say that these are just second-hand accounts. But the evidence above on BYU's website seems to provide convincing support that the words originated with Joseph. Also, who else would say something so specific? Who else but the prophet would know that some ordinary-looking Indian bones belong to a 'white Lamanite named Zelph'? Who else but Joseph would know the name of the "great prophet Onandagus, who was known from the Hill Cumorah, or eastern sea to the Rocky mountains". Critics want the story of Zelph to be true as there is much evidence to show that the BOM history did not happen in North America. Conversely, many LDS apologists do not want Zelph to be taken literally as they prefer to endorse theories that the BOM history took place almost exclusively in either Central or South America. Perhaps they think that it is harder to disprove that the BOM happened in those places. The real significance of Zelph and the geography has to do with the location of the Hill Cumorah. If the account of Zelph is true, and we accept that the bulk of the BOM history took place in North America, then it is logical to assume that the Hill Cumorah in New York, where Joseph dug up the plates that Moroni buried, must be the same Hill Cumorah that was the location of two massive battles (or series of battles) described in the BOM where a total of 2.2 Million Lamanite, Nephite and Jaredite warriors battled to their deaths using steel swords and other weapons of war. If that's the case, then since no evidence of these massive battles with 2,200,000 men or their weapons has ever been found in Cumorah, NY, then those stories might be mere fiction. If those two key stories are fiction, then it stands to reason that the entire Book of Mormon may not be real history either. Also of curious note is the obvious lack of mention in the Book of Mormon of this "great prophet Onandagus, who was known from the Hill Cumorah, or eastern sea to the Rocky mountains". Because of the seeming absurdness of the Zelph story, critics often lampoon it as in this humorous depiction of Zelph called the Book of Zelph. A backup of this page is here.